The morning of April 20 brought new hope to the city of Boston. The long and harsh New England winter had finally loosened its grip, and the 118th Boston Marathon was set to begin in Hopkinton, Mass., with the Elite Men at 10 o’clock sharp. Bostonians near and far, in body, and in spirit were primed to take back the city just over a year after a tragic act of domestic terrorism shook its very foundation. The early atmosphere was excited, but jittery. Participants and well wishers alike worried that new security measures designed to ensure their safety would cause confusion and stress, interfering on a day that has historically been filled with joyous traditions and ceremony. The Tough Ruckers, a military contingent that usually makes the 26.2-mile trek wearing full military rucksacks would not be allowed to carry backpacks this year. Bandits, or unofficial runners, (oftentimes those jumping in with a friend or family member for a leg of the race, or runners for unofficial charities), would also be banned. 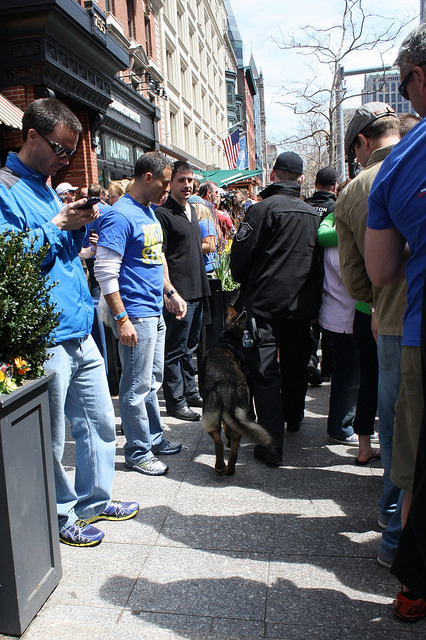 The Boston Athletic Association, FBI, Boston Police, and surrounding municipalities did their best to quell anxieties; assuring all concerned, that Boston would be the safest place in the world come Marathon Monday. 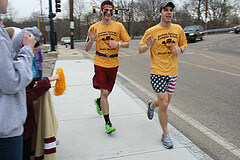 Police officials said it was not their desire for example, to restrain Wellesley College girls from kissing runners along the infamous mile 13 “Scream Tunnel,” or to upend Boston College students from handing runners beers at mile 21.These customs boasting years of marathon tradition. Cheryl Fortier, 30, of Cambridge, Mass., inspired by the resolve of the marathon victims and the spirit of the city of Boston, lost 150 pounds in order to participate in her first marathon this year. She was among the 32,000 that took to the course Monday, and shared the anxieties of many over new logistics. Officials began planning for the logistical nightmare of this year’s marathon shortly after the events of last year. With a security scare involving a backpack abandoned near the finish-line by an unhinged performance artist just a week before the scheduled event, many worried how smoothly things would run the day of. But on the morning of Patriot’s Day, the little city with a big heart rose to the occasion. 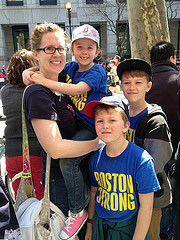 One million spectators many sporting “Boston Strong” apparel flooded the city, complying readily with the obvious security along the marathon route and cheering spiritedly for runners as they passed by. Onlookers were subject to random bag searches, blocked off alleyways, and bomb-sniffing dogs roamed. Cori Adams of Windham, N.H., didn’t seem phased by the increased police presence. She and her husband Rick traveled from their home all the way to the finish line with their three small children to watch and cheer. “Were here to see my son’s second grade teacher Ms. Banburg who is running with a broken leg,” she said. While spectators may not have even noticed the amped up surveillance, runners, on had a tougher time, with security at the starting line, air tight. Jason Dominic 42, of Boston, Mass. couldn’t have agreed more. Spectators, audible from blocks away cheered loudly as American Meb Keflezighi became the 118th Boston Marathon Champion in just two hours, eight minutes, and eleven seconds, the first American man to do so since 1983. It was an uproarious moment for Boston. Keflezighi ran with the names of the bombing victims on his bib. Boston had triumphed. 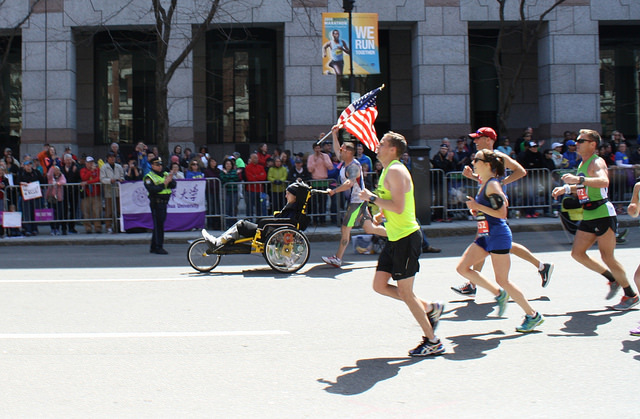 The national anthem echoed down Boylston as Keflezighi was medaled, and runners of all ages, nationalities, and skill level began to flood the finish line. Enough people participated in this year’s run to nearly fill Boston’s iconic Fenway Park. Past the finish line announcers seated high above the exiting participants beckoned runners via megaphones to food, Gatorade, and water stations down the street. Some good-naturedly heckled the runners, reminding them of what not to expect at the runners’ village. “We’ve got food, beer, and water for you just up the street,” one announcer called. “Just kidding we don’t have beer! But wouldn’t that be nice! Get this guy a beer ladies and gentlemen!” he shouted, pointing a finger at an exhausted looking man who limped as he held his hands above his head. Nearby, in the many pubs and restaurants surrounding the finish line, runners entered in droves, and just as the announcer suggested; people bought them beers. David Christmas, 60, of Acton Mass. was one of those runners. A veteran marathoner having just completed his 17th Boston, Christmas joined friends and family as he traditionally has, at The Rattlesnake Bar and Grill for a post-marathon beer. A Narragansett tallboy waited for him, an order filled by his son, who received the request via phone as Christmas ran his last few miles—that, and another request for an update on the Sox game. After nearly two decades of running Boston, Christmas said despite changes to the event, this year felt like any other. Dave Christmas takes a swig of beer after finishing his 17th Boston Marathon. By Zoe Lake. 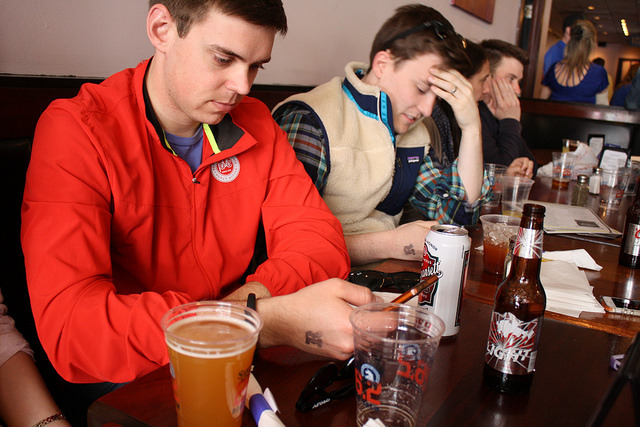 It was at the Rattlesnake that Christmas sat last year, nursing a Sam Adams 26.2 (the special Marathon brew released every spring), when the bombs went off blocks away at the finish line. Herded out by police officers and bomb sniffing dogs Christmas realized days later that he hadn’t paid his bar tab when he left. “So I called them up, found out what I owed, and wrote them a check,” he said. Owner Tony Castagnozzi was touched; he has kept the check, and a note Christmas wrote, as a momento. The men embraced after the race this year laughing at the memory. 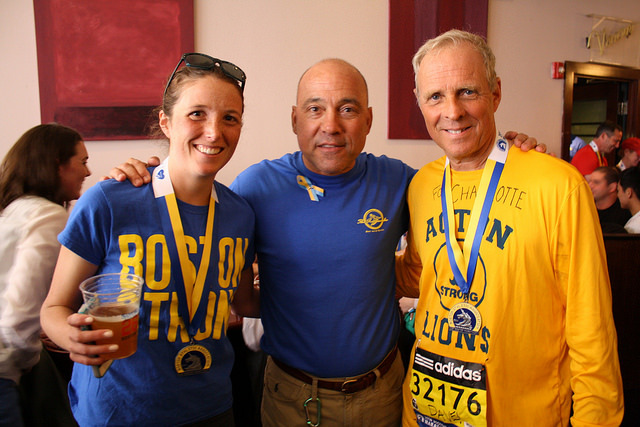 Emily Zimmerman poses with bar owner Tony Castagnozzi, and fellow marathoner Dave Christmas at The Rattlesnake Bar and Grill on Boylston following the 118th Boston Marathon. By Zoe Lake. “I still have your check downstairs,” said Tony, jostling Christmas. “How am I going to balance my checkbook?” Christmas teased back. This was Castagnozzi’s 24th marathon at the Rattlesnake. “The marathon is always the best,” he said. Like many bars surrounding the finish line, the Rattlesnake attracts the same veteran runners year after year, runners who have fostered a strong camaraderie, as runners often do. The Dempsy family of western Mass. has had two generations of runners make their way through the storied bar after the race. Kathy Dempsy gets the chills thinking about meeting friends and family there after the confusion that followed the bombing last year. Her daughter Emily Zimmerman finished her first marathon with a beer at the Rattlesnake. Kevin Burns, an 8-time Boston runner was cheered into the bar before he joined Christmas for a drink to remark on the race this year. Boston may still be mourning the loss of last years’ race, but if this year has proved anything, its that Boston will never have to mourn the loss of its traditions.